1. Combine spinach, mayonnaise, sour cream, green onions, dressing and bacon bits; spread in tortillas. Roll up jelly roll fashion; wrap in plastic wrap. Chill 4 to 6 hours. Cut into 1/2 inch-thick slices. 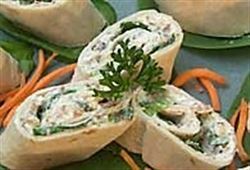 Enjoy this delicious spinach rollups Mexican recipe!